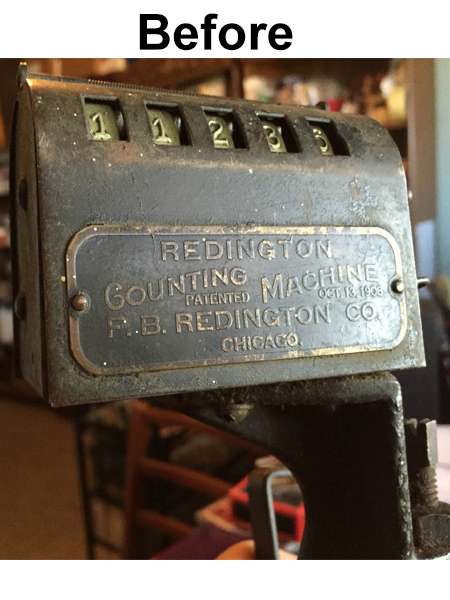 Redington Counting Machine Should I repaint or not? 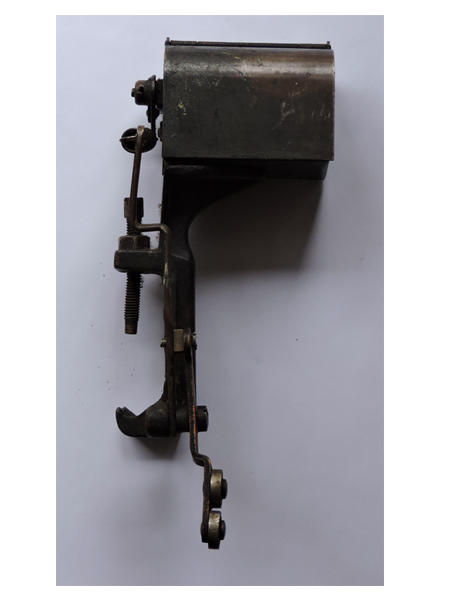 I will be acquiring my first Chandler & Price press next week. 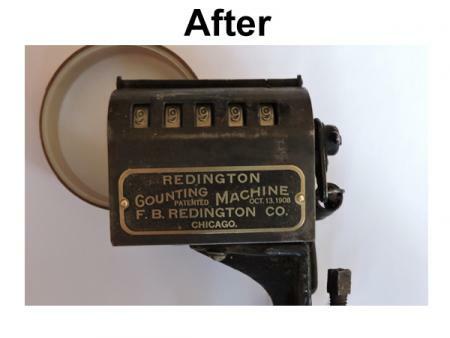 When looking for a press I seen these counters on them so in the past month I had acquired a Redington Counting Machine. I never seen one with a name plate like this one most where similar to a silk screen printed tag. So being the handy person I am I started cleaning it, cleaning one thing lead to another and now as you can see in the pictures. Have I committed a mistake??. Should I have left it the way it was. 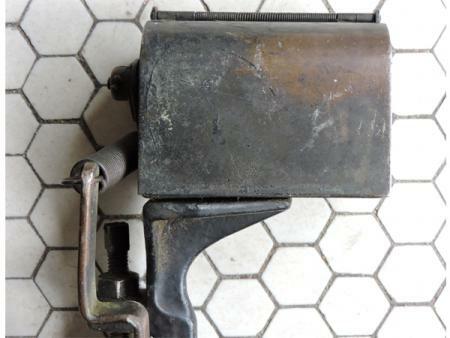 Being a prior machinist obviously my first thought is clean sand and repaint or lightly sand and leave the patina with a clear coat from my experience exposed metal is prone to rust. I already started the process so I stopped on the 2 cleaned pieces. So my question is should I repaint or it leave it as is? All cleaned/decontaminated with as gentle a process as possible, The number barrel and star wheels masked up, sprayed with (specifically) Acid Etch Primer, U,pol or similar, the best bar none, KEY, for any top coat, preferably Coach Enamel or baked on as original.!! The cover on inspection almost certainly/originally had a curved perspex plastic cover over the number wheels, not rocket science to replace. The makers *Plaque* almost certainly Brass, inspection will probably show original fitting/attatchment via 2 Twin Start Archimedes studs (not screws) usually in drilled right through, as opposed to Blind holes. I would oil it up and fit it to your new press. It needs no more attention than that. These counters would not have any plastic over the openings. It appears you have done a good job of cleaning, I would let nature take its course. 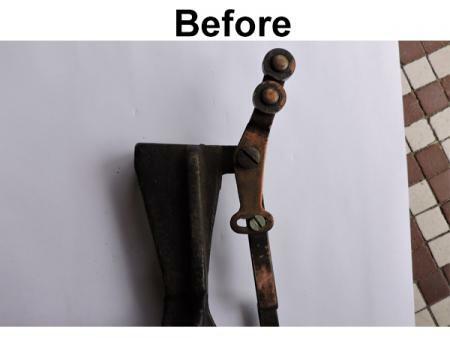 A coat of wax or clearcoat will keep the bare surfaces from any immediate corrosion, but otherwise, it appears to be in pretty good condition. John Henry has it exactly right: if it works, don’t fix it. I do believe in understanding how things work, disassembled when needed, but the cosmetic stuff really has no effect on the process or the product. You live with the process, you sell the product, but what value does a painted plaque have by itself? When you get down to aesthetics, I cringe whenever I see printing equipment in a fresh coat of grey paint. It may be hiding something. Here the old reticulated paint is an indication of honesty. jhenry thank you for the input, I am at a crossroad here. Yes the plaque and twhat I call small arms cleaned up well for the exception of some discoloration on some of the edges. I got to see the stamp date on it Feb 28, 1911 which wasn’t visible before. I stayed away from using chemicals on the cleaning, they where all a mixture of home mixes and an old mix I found online from 1903 some time ago and along with 2 weeks of cleaning, I did use a small polishing tool to shine up the plaque and the other 2 pieces with a small amount of compound. henry what of the caked on paint that it has (reference photo 5 & 6) on the back I mean Ink, should I remove or leave as is? I already cleaned up the front of it. 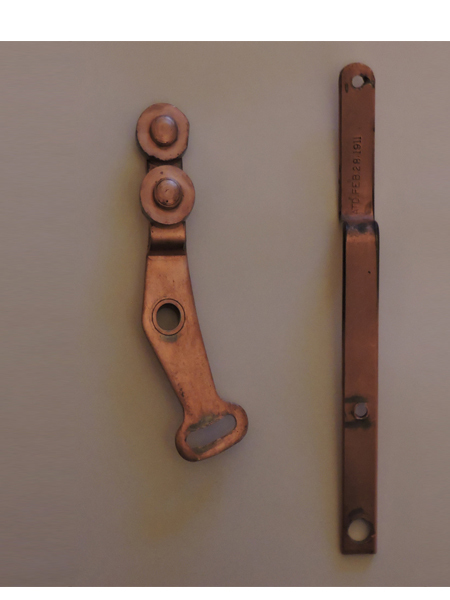 I am going to clean up some small pieces it has on the right side ( reference photo 1) of the counter that are I believe brass which have the spring attached and held in place by a cotter pin. Its funny how people remember someone, for me in my circle I’m just plain ole John the printer I’m always referred to in that manner. parallel_imp thank you for the comment, yes the new painted look does arise suspicion and takes the life or originality as they may say from the piece. Patina on an item tells a story from what a friend tells me and is sometimes considered more appealing than a freshly painted piece even if done right. As I asked jhenry should I remove the old paint that it has on the back? (photo 5 & 6). Oh by the way by paint I mean ink that has fallen on the counter and not what is left of the original paint I tried very hard not to remove the original paint from the front. I am going to clean up some small pieces it has on the right hand side that works the mechanism when pulled, they appear to be brass but as far as the casing and iron that is where the question to repaint or just clean up and spray a clear coat to prevent any oxidation or use a coat of wax. 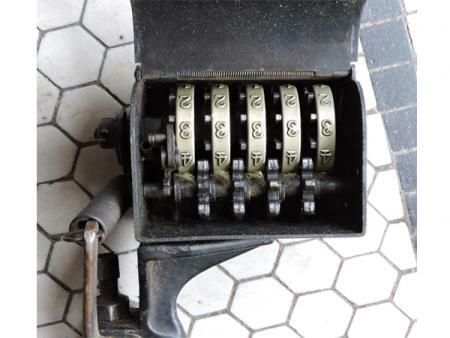 We have the similar press and a counting machine, but we need a new counting machine. Where may we purchase one? I have various used ones in stock. Send me a picture of one on your press and I will see if I have one to match up.